Click below or click here to instantly download the digital version for $24.99, (includes clickable links and printable forms). You can also keep reading to check out some frequently asked questions about the book. Are you tired of showing up to your routine personal training job each day to train a handful of clients and receive an hourly session fee? Do you have a gym or studio that struggles each month to meet the bottom line? Are you ready to command your fitness profession income? As a fitness and nutrition professional, the truth is that you are drastically underpaid. While it really is true that you can make six to seven figures as a personal trainer, the traditional industry is not set-up to accommodate the large salary that you could and should be making. Instead, you’re stuck with a relatively small commission or an hourly pay structure. But to truly succeed in the fitness business, you must take matters into your own hands, and the only way to accomplish this is if you have multiple income streams. Ben Greenfield, the nation’s top personal training business expert, has written the book “Personal Trainers’ Guide To Earning Top Dollar” to identify those streams and provide you with the exact instructions for easily commanding a high income, creating your fitness empire, and establishing yourself as a respected expert in your niche market area. Whether you are a gym employee or a private business owner, this book will give you everything you need to maximize your income as a fitness professional, nutritional consultant, or personal trainer. Ben has designed simple and practical, but highly effective income-enhancing strategies that allow you to step outside the mold and become a fitness celebrity with an enormous client waitlist, online empire, and a wide range of unique marketing strategies. -Produce returns far above what you can earn in a gym or studio environment. -Focus on automated income-enhancing techniques that make you money while you sleep. -Allow you to charge several hundred dollars per hour for your services. -Teach you how to establish yourself as a regional and national celebrity expert in your field. 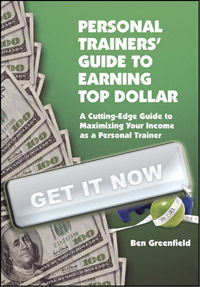 In “Personal Trainers’ Guide To Earning Top Dollar” Greenfield explains all ten strategies and then provides step-by-step instructions and resources to implement these moneymaking opportunities with ease. Each chapter of the book includes step-by-step instructions, printable forms, templates, phone numbers, website links, real life examples and insider tips and tricks. Any individual who works in the exercise or nutrition services industry can highly profit from the practical information in “Personal Trainers’ Guide To Earning Top Dollar”. Specifically, if you are currently a coach, trainer, adviser, or consultant, you will learn how to maximize your client number and waitlist, leverage your knowledge in unique ways and charge top dollar for your services. Why is there an electronic version available? This book can be effectively utilized in electronic format because of the high number of printable forms and templates, as well as all the specific website links to various resources for each of the chapters. Otherwise, to really utilize all the tips, you’d spend all your time at the copy machine and re-typing URL’s into your browser! What do you mean by “Top Dollar”? Wake at 8am, open your computer, download your online information product processing reports from 4 websites and transfer $400 per website into your personal bank account. Wake-up and make a transfer from Paypal to your bank account for several dozen overnight e-book sales. Perform 3 thirty minute nutrition and fitness phone consultations at $100 each. Spend another thirty minutes responding to a handful of online training client Q&A’s at $20 per e-mail. Go speak for 45 minutes at a corporate wellness event with 300 attendees, at $2/head. Meet two clients at their home gyms for $200/hr (gas and travel expenses paid). Go out to dinner, catch a movie or a basketball game, and head home. Sound better than working at a gym 8 hours a day? Then whether you’re a personal trainer, gym owner, or aspiring fitness professional, you’re ready to train for top dollar. “Personal Trainers’ Guide To Earning Top Dollar” will teach you everything you need to know and give you all the specific resources you need for instant financial success, including step-by-step instructions, printable forms, templates, phone numbers, websites, real life examples and insider tips and tricks. What’s the idea behind the book? Ben Greenfield wrote “Personal Trainers’ Guide To Earning Top Dollar” after realizing that an enormous number of personal trainers, nutritional consultants, and lifestyle coaches think of their jobs as a “9-5” hourly salary routine of meeting with individual or small group clients. In reality, the health or fitness professional has a dynamic opportunity to leverage knowledge and expert status for an enormous salary with multiple automated income streams. This book literally teaches you how to command a very high wage for your client services while ensuring that cash flow is limitless, even while you’re sleeping! Is this book good for “beginner” personal trainers? Especially because many trainers think of their jobs as a “moon-lighting” venture to supplement another higher-paying job, or as a stepping stone to a “real” career, this book is perfect for approaching your new career with the correct mental frameset and money-making knowledge. In reality, personal trainers and nutrition or fitness professionals can actually command a salary as high as physicians, lawyers, and CEO’s, and actually work less. The key is information leverage, unique time management techniques and niche marketing. You’ll learn each of these concepts in “Personal Trainers’ Guide To Earning Top Dollar”. Chapter 1 – Face-To-Face Training: In this chapter, you’ll learn about how to enhance the financial effectiveness of your face-to-face training sessions, the accepted industry standard for personal training, and the bread and butter for most trainers. I’ll tell you about fee structure and give you a method that will keep you automatically generating revenue and never having to re-sell clients. Highly effective time management techniques like workout templating are outlined, along with group training business structure, the best method of accepting payments, how to create a corporate structure, the tips and tricks to an “instant-sell” consultation, how to conduct your personal training sessions to keep the client coming back for more every single time, and a final chapter-ending tip that may turn out to be your biggest moneymaker yet. Chapter 2 – Exercise As Medicine: Over 40 million Americans face the direct threat of metabolic disease due to their lifestyle patterns. Each of these individuals is going to end up seeing a physician. Do you have a system in place for a smoothly operating physician-to-trainer and trainer-to-physician client referral system? This chapter explains why a new directive from the American Medical Association is going to pay big dividends for trainers who are ready, and gives you the exact forms, letters, and instructions you’ll need to be optimally prepared for the flow of patient referrals and one giant step ahead of the game. Chapter 3 – Online Coaching: You’ve heard of online personal training, but how does it practically work? In this chapter, you’ll learn how to host and build your website, advertise your online services, optimize client interactions, generate client testimonials, find free document swapping tools for sharing files with your clients, upload photo and video, chat and talk to your clients live for no charge, and set-up free FAQ and forums sections for your websites. You’ll also learn the two top tips for launching you into an extremely high ranking position on a Google search. Chapter 4 – The New Web: This chapter will teach you how to turn yourself into an online celebrity and recognized expert in your niche market, using cutting edge search engine optimization tools like audio and video podcasting, blogging, RSS, Google adwords and adsense, affiliate marketing, opt-in lists, e-newsletters and add-on domains. Using techniques like viral video marketing and keyword driven online ad campaigns, you’ll learn exactly how to maximize your online presence, rise above the local and online training competition, and reap enormous financial rewards using the latest technology. Chapter 5 – Outsourcing: Time is finite. In Chapter 5, you’ll learn how to exponentially increase the effectiveness of your expertise by utilizing other people to do much of the busy work for you, for inexpensive. Your time is valuable, whether researching exercise topics, creating websites, sending relevant articles to your client base, assisting in exercise photo and video creation, and submitting your fitness articles and press releases to media sources. This chapter teaches you two incredibly effective methods that get this work done for you at a fraction of your price and time. Chapter 6 – Diet Supplements: The dietary supplement industry is huge, and personal trainers are in a perfect position to receive a very large slice of the pie. You can command an enormous salary through direct sales, supplement network marketing, affiliate sales, and online distribution. As an educated health professional, you’ll learn how to get started in the supplement representation industry, one unique method for using your expertise to receive a lifetime of free supplements for your own consumption and for selling to your clients, and another unique product representation technique that sets you up for a high percentage royalty kickback. Chapter 7 – Nutrition Consulting: In this chapter, you’ll learn about how to become educated and certified to dispense dietary advice, legal considerations of nutrition consulting, how to implement your offerings into a successful business, and one simple way to leverage your nutrition advice into a massive client-generating tool. I’ll provide you with every website and tool that you need to have a smooth running nutritional consulting empire established within just a few weeks. Including nutrition services in your business can often generate greater revenue than the exercise component of personal training, and Chapter 7 will teach you how. Chapter 8 – Information Products: Imagine waking up in the morning, opening your computer, and finding out that you made a few hundred bucks while sleeping. Information product creation is a huge component of fitness, and sharing your information virtually can reap enormous benefits. In this chapter, you’ll learn how to easily create and market books, DVD’s, and electronic information products, thus instantly automating your income! You’ll learn how to find book agents and editors for successful publishing, how to replicate your DVD’s and print your books both locally and nationally, and simple tips and tricks to get inexpensive UPC’s, ISBN’s and bar codes. This chapter also includes specific instructions on one highly effective strategy for taking all the headache out of finding a book agent and marketing your information product. Chapter 9 – Offsite Training: Home and corporate personal training offers opportunity for zero overhead costs, a much higher paying clientele, and a larger number of potential customers. This chapter teaches you how to build your offsite training business using corporate seminars and wellness programs and home and corporate personal training gym design consultation. You’ll learn how to net thousands of dollars per month from wealthy home clients and corporate groups, while receiving compensation for driving time and gas costs – with zero overhead fees. This chapter also includes several highly effective strategies for fee structure and marketing. Chapter 10 – Marketing Yourself: There’s a reason that the best fitness or nutrition professionals in the world aren’t necessarily the wealthiest. Marketing is a key component of the fitness business, and this chapter teaches you how to find your niche market, get published in newspapers and magazines, become a recognized television fitness celebrity, and saturate the community and country with your expertise! You’ll learn how to optimize and format your press releases, how to be featured on your local television station whenever you please, and how to charge top dollar for your public appearances!